Our weekly Family Service caters for all ages. During the first part of the service we all worship together in song and in prayer, with occasional children’s talks and missionary reports. After about half an hour the children leave for Junior Church and the young people to Bible Class. Communion is celebrated most weeks, and an invited speaker brings to us the Word of God. The service is normally followed by refreshments. A time of prayer, praise and worship in an informal setting. 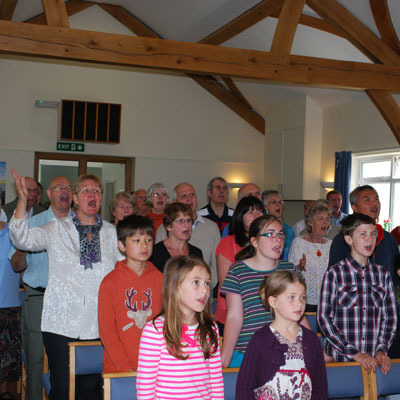 The prayer meeting normally opens with song and Bible reading led by one of our church members. An extended time of open prayer then follows. The prayer is sometimes directed towards specific issues, and there is always the opportunity to praise God and to bring to Him the needs of the Church and the wider community. The Women’s Meeting meets every week apart from a short break for Christmas / New Year and a slightly longer break in the summer. The ages of women currently attending range from 40's to 90's, but ladies of any age are always very welcome to join the group. The ladies come eager to meet each other, enjoy a chat, a cup of tea and a biscuit, as well as listening to invited speakers. The meeting is similar each week; the first half hour is a time of singing and then a break for tea - we even have the occasional cake for special birthdays, etc! The remaining half hour is taken by the speaker who normally speaks from a Bible passage but we also have talks from missionaries and visual presentations on Christian work. There is an annual daytrip arranged to a nearby attraction and a yearly visit to a garden in Clevedon for a very scrumptious cream tea! 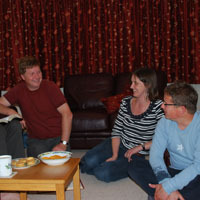 Home Care Groups meet most weeks in homes around the town for prayer, praise, teaching and fellowship. We aim to care for every member of the Church, in both spiritual and practical ways. Therefore, everyone in the Church is assigned to a group even if they feel unable, for whatever reason, to meet with the group.